This article defines flaps, describes their purpose, and details what to remember when performing flap surgery. Flap surgery is a subspecialty of plastic and reconstructive surgery. Various types of flaps are performed, and the indications for them are even more diverse. Rather than discuss all the different types of flaps ever used, this article aims to outline the broad classification of flaps and to provide basic principles to remember when preparing for the operating room. For more details on particular flap procedures, please see the Flaps section of the Plastic Surgery journal. A flap is a unit of tissue that is transferred from one site (donor site) to another (recipient site) while maintaining its own blood supply. Flaps come in many different shapes and forms. They range from simple advancements of skin to composites of many different types of tissue. These composites need not consist only of soft tissue. They may include skin, muscle, bone, fat, or fascia. 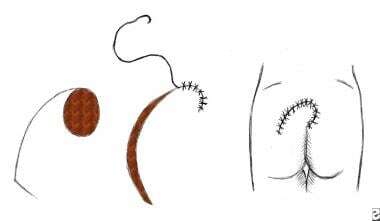 How does a flap differ from a graft? A flap is transferred with its blood supply intact, and a graft is a transfer of tissue without its own blood supply. Therefore, survival of the graft depends entirely on the blood supply from the recipient site. The term flap originated in the 16th century from the Dutch word flappe, meaning something that hung broad and loose, fastened only by one side. The history of flap surgery dates as far back as 600 BC, when Sushruta Samita described nasal reconstruction using a cheek flap. The origins of forehead rhinoplasty may be traced back to approximately 1440 AD in India. Some reports suggest flap surgeries were being performed before the birth of Christ. The surgical procedures described during the early years involved the use of pivotal flaps, which transport skin to an adjacent area while rotating the skin about its pedicle (blood supply). The French were the first to describe advancement flaps, which transfer skin from an adjacent area without rotation. Distant pedicle flaps, which transfer tissue to a remote site, also were reported in Italian literature during the Renaissance period. 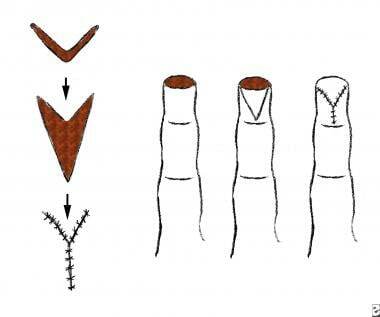 Subsequent surgical flap evolution occurred in phases. During the First and Second World Wars, pedicled flaps were used extensively. The next period occurred in the 1950s and 1960s, when surgeons reported using axial pattern flaps (flaps with named blood supplies). In the 1970s, a distinction was made between axial and random flaps (unnamed blood supply) and muscle and musculocutaneous (muscle and skin) flaps. This was a breakthrough in the understanding of flap surgery that eventually led to the birth of free tissue transfer. In the 1980s, the number of different tissue types used increased significantly with the development of fasciocutaneous (fascia and skin) flaps (which are less bulky than muscle flaps), osseous (bone) flaps, and osseocutaneous (bone and skin) flaps. Most classification systems have been designed for the sole purpose of aiding communication with peers by being familiar with the correct vocabulary to use. However, the crucial point for any physician to remember is that communication with the patient is of foremost importance. The patient must be able to picture, with the surgeon's guidance, what the surgeon is planning. Many different methods have been used to classify flaps. Furthermore, these classification systems are often complex and varied in principle. To improve the reader's understanding of flap classification, the author has summarized the most commonly used classifications into 3 simplified categories: type of blood supply, type of tissue to be transferred, and location of donor site. Like any living tissue, flaps must receive adequate blood flow to survive. A flap can maintain its blood supply in 2 main ways. If the blood supply is not derived from a recognized artery but, rather, comes from many little unnamed vessels, the flap is referred to as a random flap. Many local cutaneous (skin) flaps fall into this category. If the blood supply comes from a recognized artery or group of arteries, it is referred to as an axial flap. Most muscle flaps have axial blood supplies. Patterns of muscle flap vascular anatomy. Type I - One vascular pedicle. Type II - Dominant pedicle(s) and minor pedicle(s). Type III - Two dominant pedicles. 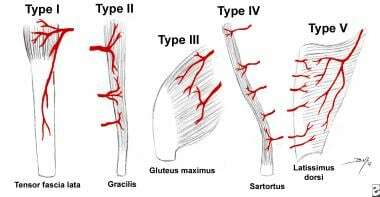 Type IV - Segmental vascular pedicles. Type V - One dominant pedicle and secondary segmental pedicles. In general, flaps may comprise in part or in whole almost any component of the human body, as long as an adequate blood supply to the flap can be ensured once the tissue has been transferred. Flaps may be composed of just one type of tissue or several different types of tissue. Flaps composed of one type of tissue include skin (cutaneous), fascia, muscle, bone, and visceral (eg, colon, small intestine, omentum) flaps. Composite flaps include fasciocutaneous (eg, radial forearm flap), myocutaneous (eg, transverse rectus abdominis muscle [TRAM] flap),  osseocutaneous (eg, fibula flap), tendocutaneous (eg, dorsalis pedis flap), and sensory/innervated flaps (eg, dorsalis pedis flap with deep peroneal nerve). Therefore, another way of classifying flaps is by describing the different types of tissue that are being used in the flap. Tissue may be transferred from an area adjacent to the defect. This is known as a local flap. It may be described based on its geometric design, be advanced, or both. Pivotal (geometric) flaps include rotation, transposition, and interpolation. Advancement flaps include single pedicle, bipedicle, and V-Y flaps. Tissue transferred from an noncontiguous anatomic site (ie, from a different part of the body) is referred to as a distant flap. Now that the main ways of classifying flaps have been introduced, the remaining sections of this article are devoted to the most important principles to remember before performing flap surgery. Like any surgical procedure, flap surgery is not devoid of risk. Complications such as complete flap loss can be catastrophic. Considering the following basic principles before any flap surgery serves patients well by optimizing outcome and decreasing operative morbidity. This is a particularly important principle. When filling in a defect, replace like with like. Ralph Millard once said, "when a part of one's person is lost, it should be replaced in kind, bone for bone, muscle for muscle, hairless skin for hairless skin, an eye for an eye, a tooth for a tooth." If this cannot be accomplished, use the next most similar tissue substitute. 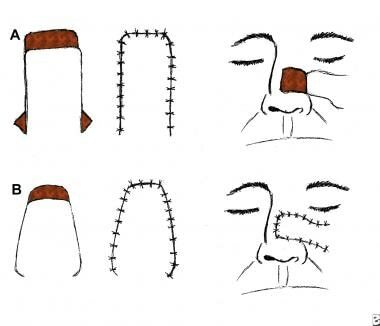 For example, the surgeon can use scalp to replace a beard or skin from the forehead to cover a nose wound. The goal is to camouflage the reconstruction as much as possible. Everyone can learn from Mother Nature's blending tricks. The surgeon's goal is to create an effect as subtle as a chameleon changing colors as it moves through its surroundings. An example of this can be found in the treatment of any eyelid injury. The best course of action when faced with a full-thickness defect is to use eyelid skin from the contralateral eye. If this is not possible, the next best substitute is a full-thickness posterior auricular skin graft. This provides the most similar substitute tissue, with a satisfactory color match and minimal tendency toward contracture. If the surgeon's work can pass unnoticed, he is to be congratulated as having accomplished his task as a reconstructive surgeon. According to Millard, human beings may be divided into 7 main parts: the head, neck, body, and extremities. Each of these body parts can be further subdivided into units. The head, for example, is composed of several regional units: scalp, face, and ears. Consider that each of these units has its own unique features, and each feature has, in turn, multiple subunits with their own special shapes. All of these different units and subunits must be considered and reproduced during reconstruction. As emphasized by Millard, "The most important aspects of a regional unit are its borders, which are demarcated by creases, margins, angles and hair liners." Taking this a step further, perhaps the most important principle is the way in which the borders between units come together and interact rather than just the borders themselves. Adherence to these natural borders during reconstruction is important. Most often, it is better to convert a defect that covers only a partial unit to a whole-unit defect prior to reconstruction. According to Millard, "If possible make the defect fit the flap or graft to that unit!" As with all surgery, comparing the pros and cons of each surgical option is of the utmost importance. The reconstructive ladder is a mental exercise that provides the surgeon with options ranging from the simplest to most complex. Usually, things should be kept as simple as possible. This benefits both the surgeon and the patient; the simplest plan is often the safest. However, physicians should not sell themselves or patients short. Avoid settling for the simplest procedure just for the sake of simplicity. More complex problems may require more complex solutions, and the simplest approach may be, frankly, inadequate. A sound plan must provide restoration of function and aesthetic form; these are the fundamental goals of plastic and reconstructive surgery. A nose, breast,  or finger reconstruction should be designed to fit its use and location, rather like the philosophy used by architects when designing buildings. In 1949, a pioneer of 20th-century architecture, Frank Lloyd Wright, said, "Form and function thus become one in design and execution if the nature of materials and methods and purposes are all in unison." Several years earlier, Wright had been asked to build a hotel in Tokyo. As Japan was in an earthquake zone, Wright designed the hotel to withstand shocks using a sea of mud to support the foundations. Following the Japanese earthquake of 1923, Wright's hotel was apparently the only building left standing in Tokyo. Once a plan has been determined, rehearse it. Trace the defect or cut a pattern to fit the defect. Transpose the pattern and experiment with it to decide on the best donor area and orientation. Omitting this step is akin to Wright building his hotel without a blueprint, and his materials were much cheaper than the surgeon's. Finally, the surgeon should ask him or herself "what do I do next if this fails?" Proceed to the operating room only after answering this question definitively. Once in the operating room, keep an open mind and be ready to adjust the surgical plan as the situation dictates. Apply the "Robin Hood" principle: steal from Peter to pay Paul, but only when Peter can afford it. Using what the body has to reconstruct a deficit is essentially "robbing the bank." The goal to achieve is ultimate efficiency, or, according to Millard, "getting something for almost nothing." Examples of local flaps illustrating Millard's point are shown in the images below. An interpolated flap. The donor site is separated from the recipient site, and the pedicle of the flap must pass above or beneath the tissue to reach the recipient area. (A) Flap is outlined and elevated. (B) Donor site is closed. (C) Pedicle is divided once the flap is revascularized. (D) Insetting of the flap is completed. 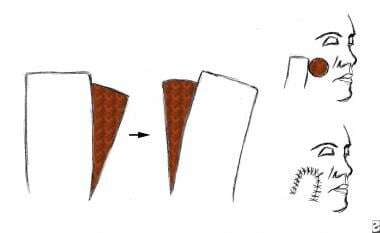 A rotation flap. Movement is in the direction of an arc around a fixed point and primarily in one plane. This is a semicircular flap. A transposition flap. The rectangular flap is rotated on a pivot point. The more the flap is rotated, the shorter the flap becomes. An advancement flap. Advancement flaps are moved primarily in a straight line from the donor site to the recipient site. No rotational or lateral movement is applied. Triangles y (Burrow triangles) have been removed lateral to the base equal to the distance of the advancement (x = y). 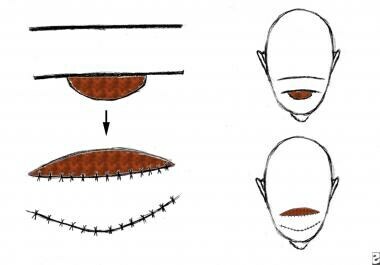 Incisions are made into the base of the flap to assist in the advancement. A bipedicle flap with incisions parallel to the advancement. Do not make the naive mistake of merely advancing tissue to the deficient area unless this can be accomplished completely without tension. Tension compromises the blood supply of the advanced tissue and, ultimately, results in flap failure. Tension is to be feared the most. It must be recognized and prevented or else used to the surgeon’s advantage. Surgeons once believed in treating the primary defect without worrying about the secondary defect. Plastic surgery has since progressed. Plastic and reconstructive surgeons now realize the importance of considering both defects equally. The reality is that it is not possible to get something for nothing; a price usually must be paid following reconstruction of a primary defect. The significance of providing coverage of a defect with minimal deformity and disability is one of the foremost principles on which the reconstructive surgery specialty is based. If reconstruction of the primary defect is too costly in terms of resultant deformity or disability, reevaluate and use another reconstructive option. Remember that donor areas are not limitless. One cannot continuously use tissue without paying back in some way. Carelessness or overuse of a donor area eventually causes damage that may be far greater than the original defect. Be thoughtful. Consider all options, simple to complex, prior to any flap surgery. Be knowledgeable. Know and understand the anatomy, blood supply, and quality of tissue available. Be prepared for failure. Have a back-up plan available in case the first plan fails. Etzkorn J, Council M. Advancement Flaps. 2017 Jun. [Medline]. [Full Text]. Masia J, Navarro C, Clavero JA, Alomar X. Noncontrast magnetic resonance imaging for preoperative perforator mapping. Clin Plast Surg. 2011 Apr. 38(2):253-61. [Medline]. Mathes SJ, Nahai F. Classification of the vascular anatomy of muscles: experimental and clinical correlation. Plast Reconstr Surg. 1981 Feb. 67(2):177-87. [Medline]. Hamilton K, Wolfswinkel EM, Weathers WM, et al. The delay phenomenon: a compilation of knowledge across specialties. Craniomaxillofac Trauma Reconstr. 2014 Jun. 7 (2):112-8. [Medline]. Teo KG, Rozen WM, Acosta R. The Pectoralis Major Myocutaneous Flap. J Reconstr Microsurg. 2013 Apr 15. [Medline]. Cornejo A, Rodriguez T, Steigelman M, Stephenson S, Sahar D, Cohn SM, et al. The use of visible light spectroscopy to measure tissue oxygenation in free flap reconstruction. J Reconstr Microsurg. 2011 Sep. 27(7):397-402. [Medline]. Oh TS, Lee HS, Hong JP. Diabetic foot reconstruction using free flaps increases 5-year-survival rate. J Plast Reconstr Aesthet Surg. 2013 Feb. 66(2):243-50. [Medline]. Mohan AT, Saint-Cyr M. Anatomic and physiological fundamentals for autologous breast reconstruction. Gland Surg. 2015 Apr. 4 (2):116-33. [Medline]. Sadigh PL, Hsieh CH, Feng GM, Shih HS, Jeng SF. A "green" approach to secondary reconstruction: the concept of the recycle flap and a classification. Plast Reconstr Surg. 2015 Feb. 135 (2):401e-12e. [Medline]. [Guideline] Ragbir M, Brown JS, Mehanna H. Reconstructive considerations in head and neck surgical oncology: United Kingdom National Multidisciplinary Guidelines. J Laryngol Otol. 2016 May. 130 (S2):S191-7. [Medline]. [Full Text]. Cormack GC, Lamberty BG. The Arterial Anatomy of Skin Flaps. 2nd ed. Edinburgh: Churchill Livingston; 1994. 1986. Fisher J, Gingrass M. Basic principles of skin flaps. Georgiade GS, ed. Georgiade Plastic, Maxillofacial and Reconstructive Surgery. Waverly Co; 1992. 20-22. Kayser MR. Selected Readings in Plastic Surgery. Surgical flaps. 1999. 9(2): 1. Lamberty BG, Cormack GC. Progress in flap surgery: greater anatomical understanding and increased sophistication in application. World J Surg. 1990 Nov-Dec. 14(6):776-85. [Medline]. McDowell F, Valone JA, Brown JB. 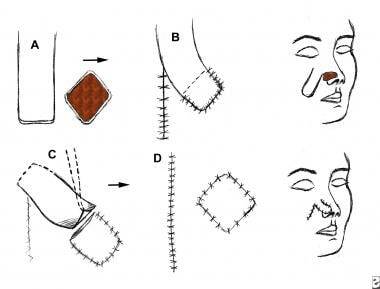 Bibliography and historical note on plastic surgery of the nose. Plast Reconstr Surg. 1952. 10:149. Millard DR. Principalization of Plastic Surgery. Boston: Little Brown & Co; 1986.